I have many fond memories of the fighting fantasy books created by the legends Steve Jackson and Ian Livingston. I devoured them during childhood and still have a number of them of my shelves, including the very first, the Warlock of Firetop Mountain. At the same time I also discovered the joy of the roleplay game, moving through imaginary worlds full of danger, adventure and strange, exotic creatures. The idea that you are a part of the story, that you have some form of control over the outcome is a powerful attraction and even in these days of massively multiplayer online and visually arresting entertainment this desire is undiminished. The Legion of Shadow is the 21st century version of the fighting fantasy story, managing to combine the magic of the roleplay game with that of the novel participation and a very engaging story. Rather than simply start on page one and move about trying not to get killed (perhaps with your finger in the last page just in case for those out there who cheated), you start with a character sheet and a map, the quests are noted in order of difficulty - green for easy, orange for harder, blue for tough and red for extreme - and you simply go to that page to begin the quest you want to and guide your hero through the world of Valeron; although it is recommended to start with the easier quests till your character gets a bit tougher. There are even "legendary monsters" that you can choose to fight, if you should desire. This is an exceptional idea and manages to improve on the systems used in the past, introducing an even greater degree of freedom, a greater sense of taking part in a "role-play" and introducing a much more non-linear approach. Combat is handled just like it is in most roleplay games, rounds of combat which take into account the combatants attributes and the outcome decided on the role of 2d6 added to the relevant ability score with the loser taking damage to armour and health until one or the other dies. Special abilities and magical items add an extra dimension and you can even carry out tasks such as imbibing health potions. At various points in the quest there are other skill based challenges such as scaling cliffs, carried out by rolling 2d6 and adding the appropriate attribute score, with the aim to get a score higher than the number given for the challenge. The story itself is crafted in a consummate manner and really manages to create a wonderful sense of immersion, you can see that not only has a lot of thought gone into the overall story but the different paths, dialogue, choices and fights. The choices seem quite logical and I can't remember any point that I didn't agree with an outcome. There is plenty of combat against a wide variety of enemies and no two fights are quite the same and the levelling seems very well balanced, it never became too easy or difficult. 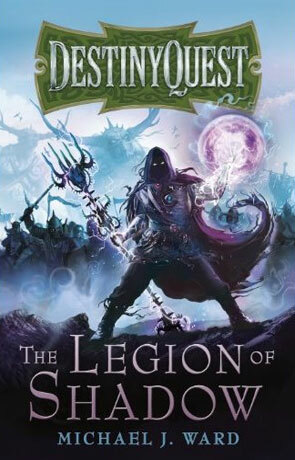 Simply put The Legion of Shadow redefines the "game" book, an incredibly well written journey and the perfect way to encourage the young adult reader or just enjoy a more envolved journey than the average novel offers. Written on 17th August 2012 by Ant.